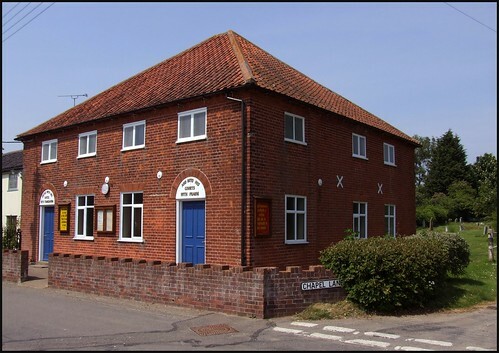 Charsfield Baptist chapel is one of the best known in Suffolk because it features in the book, and film, of Akenfield, which was based by its writer Ronald Blythe upon the village of Charsfield. Blythe's interviewees recalled what was true in many parts of rural England, that in the early years of the last century many people attended the Anglican parish church in the morning and the local non-conformist chapel in the evening. It helped to keep the mainstream of the Church of England on the straight and narrow protestant way. I dare say that this is less common nowadays. Charsfield chapel was built in 1808, and thus is celebrating its bicentenary this year. It is a simple, square red brick chapel, similar to many other rural Baptist churches, a hint of the neo-classical but without ornament. Enter into his Gates with Thanksgiving, it says over one door, And into his Courts with Praise over the other. Non-conformist chapels were a huge draw in this part of Suffolk in the 19th century. At the time of the 1851 Census of Religious Worship, well over three hundred people were regularly attending Sunday services here - the Anglican parish church could claim just over sixty. The Rector of St Peter claimed that the village contained not a large number of Baptists - if he was right, it must mean that they were coming in from far and wide. Today, the Baptists are the largest non-conformist denomination in East Anglia - only Anglicans and Catholics have more people worshipping in churches on a Sunday, and you have to admire these often isolated rural chapel communities for this. Their militancy and fundamentalism has proved a strong position from which to grow. Their communities are relatively independent in comparison with, say, the Methodists and the United Reformed Church. In Akenfield, a chapel deacon revealed that we meet twice every Sunday. You get the cream of the people in the morning who know it is right to worship the Lord first thing, and the skim of an evening. We worship, eat our Sunday dinner, take a walk and have a piece of tea, and worship again. It is reasonable. The Strict Baptists don't change with the changes, you might say, it is very much the same. The biggest thing which is upsetting us is this Ecumenical Movement. It is getting the Roman Catholics in. If it does this, we must stay at loggerheads because with us the Roman Catholics are completely out. We stay at peace in the chapel. With your own denomination you have to live together and tolerate one another as best you can.